While the hundreds of wind turbine towers planted across northern Lincoln County may grate upon the nerves of some local residents, the sound generated by them does not exceed the state- or county-mandated levels. That was the conclusion of an acoustics, noise and sound engineer hired by the Lincoln County Commissioners. Jeff Kwolkoski, president of Wave Engineering of Littleton, presented his 12-page report accompanied with photos and acoustic graphs to the board at its Thursday, April 18 meeting. “There was no case where the noise level generated by the turbine was louder than your regulation,” Kwolkoski said. Kwolkoski’s study was prompted after the commissioners heard complaints in January from landowner Gary Withington whose family home on Highway 109 is near the Limon I and II wind farms owned by the NextEra Energy Resources. He told them the noise from the tower nearest his home was unbearable to his family and had to exceed the 60-decibel limit set by the county’s regulations for noise levels. The Lincoln County Zoning Resolution, dated April 18, 2002, states that commercial or light industrial activity is permitted so long as “the volume of sound generated does not exceed 60 decibels at the boundary line of the property.” This 60-decibel limit for the county regulation is identical to the State of Colorado’s regulation. Kwolkoski told the commissioners his study of the noise levels near the Withington home were conducted over a 10-day period from February 22 to March 4. Sound and weather monitoring was continuously recorded during that period. To get the necessary recording and measurements, Kwolkoski emplaced the sound monitoring equipment and a portable weather station near the boundary line of Withington’s property which is on Highway 109. The nearest wind turbine to the property line is NextEra’s Tower 206, which is about 1,270 feet away to the northwest. Withington had indicated that it as the source of the loudest noise. After eliminating wind noise and the sound of passing vehicles on Highway 109, Kwolkoski said Tower 206 was “clearly audible” at times from the boundary line. Those sounds included a “humming” from the tower’s turbine and a “whoosing” noise made by its blades. He said Withington had indicated the “whoosing” noise was the loudest sound being heard on his property. In addition, Kwolkoski said he had taken measurements of the turbine noise closer to the Withington residencem and found it a few decibels less than at the boundary line which is closer to the tower. To further clarify this information for the commissioners, Kwolkoski said 20 decibels is considered “extremely quiet” by most people. In comparison, people speaking in a normal conversational tone of voice from about four feet away generate sound levels of about 65 decibels. After listening to the presentation, the commissioners said they had to concur with the study’s findings that the wind turbines are not in violation of the 60-decibel noise limit. However, they admitted that anyone living near them “may not be used” to the noise levels that the towers produce. They also said amending the county ordinance to lower the decibel limit is not an option because the state regulation would prevent it. Jodi Withington, the wife of Gary Withington, was present for Kwolkoski’s presentation. Despite his findings, she indicated her family still found the noise levels produced by the wind turbines to be unpleasant and disruptive to their lives. At the conclusion of the discussion, the commissioners directed John DeWitt, the county’s Land Use Administrator, to discuss this issue with the Land Use Board at its next meeting. They suggested that for any future wind farm developments in the county, the board should consider increasing the allowable distances between the towers to be erected and any residences that exist in the area. Over the past two years, northern Lincoln County has been the site for two major wind energy projects. 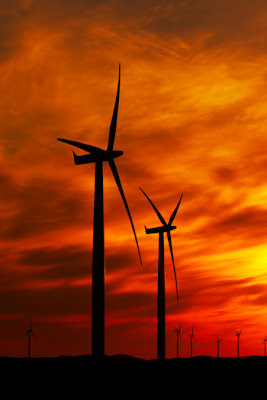 In September 2011, the 139-tower Cedar Point Wind Energy Project, owned by Enbridge, began operating. A little over a year later, the 250-tower Limon I and II Wind Energy Centers, owned by NextEra, officially opened in October 2012. Try living next to the town of Haxtun's diesel generator that puts out 120db outside the property's boundaries. 100db in the kitchen of the neighboring house.